Visit the Southfield Public Library and say hello to the City Centre’s latest art installation. 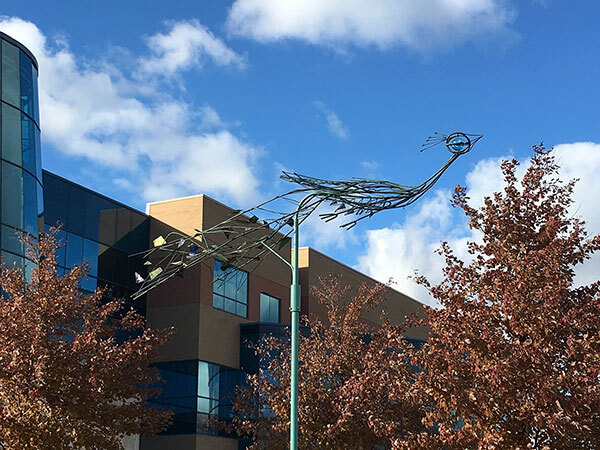 “The Peacock,” a fanciful, minimalist sculpture by Arthur Kraft, was installed this fall on the circular drive at the library’s main entrance. Like other pieces acquired by Southfield after the close of Northland Mall, The Peacock was discovered in a sealed room of the basement tunnel system. “The Peacock was found on its side, on the floor, with construction around it. It was broken, but all of the pieces were there,” says Jeffrey Ligan of the Southfield Public Arts Commission. Made of varying lengths of bronze rod stock and enameled panels, the sculpture is unique among Kraft’s work, who is largely known for his painting. “We are almost 100 percent sure this was a collaboration with another artist named Gwen Lux, who was noted for her enamel work,” Ligan says, adding that as a sculpter, Lux was recognized for her expertise in stone carving. A study in minimalism with a distinct Midcentury look, The Peacock is unique among Kraft’s sculpture work, which is more often solid, concrete animal figures. The piece is considered a windfall for the city’s collection for its unique value, and for its contribution to the art world. The chosen location at the library, where it will be enjoyed by many, is also a perfect match, says Ligan. Planned landscaping at the base of the pole will give an impression that The Peacock is taking flight. Be sure to spend some time with The Peacock on your next visit to the Southfield Public Library. You can’t miss it!